The Ainslie School Parents & Citizen's Association (P&C committee) is a group of parents, carers and friends of the school which coordinates and manages a range of activities to support the school and its students. The P&C Association is also a link between the School Board, parents, carers and the school. The P&C Association offers a great opportunity for all parents and carers to be involved in the school. Our P&C Association raises a significant amount of funds to support learning at the school and the school's facilities. Funds raised by the P&C committee have contributed to a range of projects including the school's music program, sports programs, canteen, playgrounds, end of year speech day, year 6 graduation and the vegetable gardens. The office bearers for the P&C are as follows. Please feel free to contact any of them if you have a question about the P&C - if they can't answer it, then they will know who can! Email: mel@meltin.netThe office bearers are supported by a number of other dedicated parents who undertake various roles. The P&C Committee runs a range of great services and programs, both in school and outside of it, as well as fund raising to support the school. We always value any time you can spare to help make our school great! After School Care Program (known as Afters) provides before school care, after school care as well as holiday care programs. Canteen known as Oishii, is open 5 days a week and provides healthy and nutritious food for students and staff. Uniform Shop provides parents with the opportunity to purchase Ainslie School uniforms at the school, it is located in the school hall. 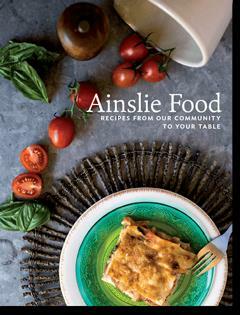 "Ainslie Food": is Ainslie School's cookbook produced by the P&C. This beautiful book contains over 125 recipes and can be purchased for $25 from the school canteen. The proceeds from Ainslie Food contribute to the development of our outdoor grounds as great gathering and learning spaces. We will also direct the proceeds to further enhancing the learning environment that our passionate and skillful teachers can provide in our classrooms. The P&C Association assisted the school's SRC to fundraise for Asthma Awareness by hosting a pancakes and pyjamas day. Pictured here are Kate (Principal), Rochelle (Vice President), Nova (President) and Sharon (Treasurer) cooking up a morning spread of pancakes. You'll notice Kate is in her cow print onesie!